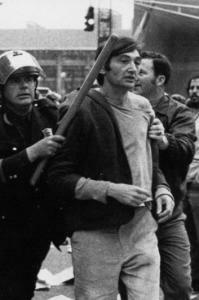 Howard Zinn, who died Wednesday at age 87, was an activist who fought injustice wherever it festered: in Washington, in the Deep South, in impoverished countries overseas, or in the halls of a university. He was a radical who confronted power fearlessly, and he was arrested countless times for disturbing the peace - which was just fine, he would say, if he was also disturbing the war. What he was not, rather incredibly, was angry. Those who knew Zinn as a professor at Boston University, as a historian and playwright, or as a neighbor in the Auburndale section of Newton were struck by his polite, hopeful, almost preternaturally calm manner. Police officers he confronted at demonstrations invariably wanted to shake his hand. Even at the peak of the civil unrest in the 1970s, when many thought the world had gone mad, he did not project rage. Instead he gave people a focus for their anger, so it could be channeled to make change. He seemed to know instinctively that anger is born of impotence, a frustration that can melt away just by doing something about it. In his teaching and his activism, he gave people confidence in their own agency. His famous books and plays are exactly about the power of ordinary people to affect history. The son of immigrants - a factory worker and a homemaker - he did just that. Integrity is an often-misused word that means being “whole’’ or “entire,’’ and Howard Zinn had it, because he embodied the compassionate world he wanted to create.